Most people would expect information on strongest animal facts to include big, tough animals, not insects. However, pound for pound, the Rhinoceros Beetle is one of the strongest animals in the world, and here's why. Where an adult elephant can lift about 25 times its own weight, the rhino beetle can lift 850 times its own body weight. That is more than any other animal recorded. They are also a popular pet, especially in Asia where they can cost up to $350 U.S. dollars. Among the interesting Rhinoceros Beetle facts in the list below, you will read about their habitat, appearance, and what their diet is. This information is written for both kids and adults. Click here for a great selection of Amazon.com books about the Rhinoceros Beetle. The Hercules Beetle can reach 6 inches (15 cm) in length, which makes them the largest species of the Rhino Beetle, the largest beetles in the world. The male Rhino Beetles have signature horns on the top of their head, very similar to a rhinoceros, which can be two-thirds their total body size. They are used for dual purposes including digging underground and fighting other males for the right to mate. Rhinoceros beetles protect themselves from predators and other rhino beetles with a very tough exoskeleton, which is shiny and ranges in color from light brown to black. Rhinoceros Beetles have two sets of wings and are able to fly. The outer set of wings protects the real working wings underneath. 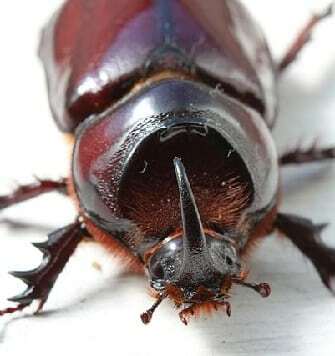 Because of the horns lightweight and hollow characteristics, it does not interfere with the beetles ability to fly. Rhinoceros Beetles are part of the Scarab Beetle family and are totally harmless to humans. They do not bite, sting, or carry any type of poisonous venom. The main predators for Rhinoceros Beetles are birds and snakes. Because they are nocturnal they are often able to avoid many other forms of would be enemies by hiding under vegetation and other forest matter. The Rhinoceros Beetle's diet consists mainly of rotting fruits, tree sap, and wood from decaying trees. Many species of Rhinoceros Beetles originated in the rainforest and forest regions of central and southern America. The United States is also home to some of the species of this beetle. When Rhinoceros Beetles take flight, it is usually because they are flying to a light source, which they are very attracted to. Stridulating, a loud squeaking noise given off by the beetle, is made by rubbing it's body parts together. This occurs when a male is looking to mate but also as a territorial sound or warning sign. The female Rhino Beetle can lay upwards of 50 eggs at a time that hatch into larvae after about 3 weeks. During the larvae period, which will last 3-5 years, the Rhino larvae will consume hefty amounts of food so that when finally mature, the amount of food needed to survive will decrease. The Rhinoceros Beetle and its larvae feed off of the forests dead and rotting trees, helping to bring down the sick and dying trees and making way for new, healthy ones. The deforestation that is currently taking place in rainforests is contributing to the beetle's population decline.